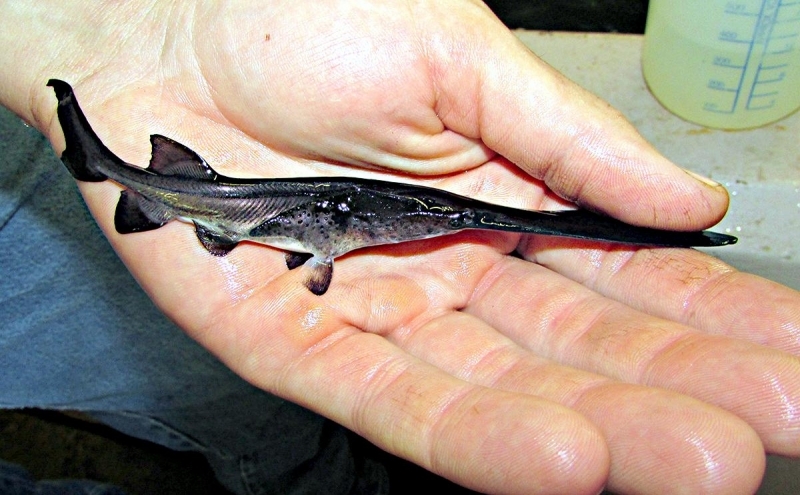 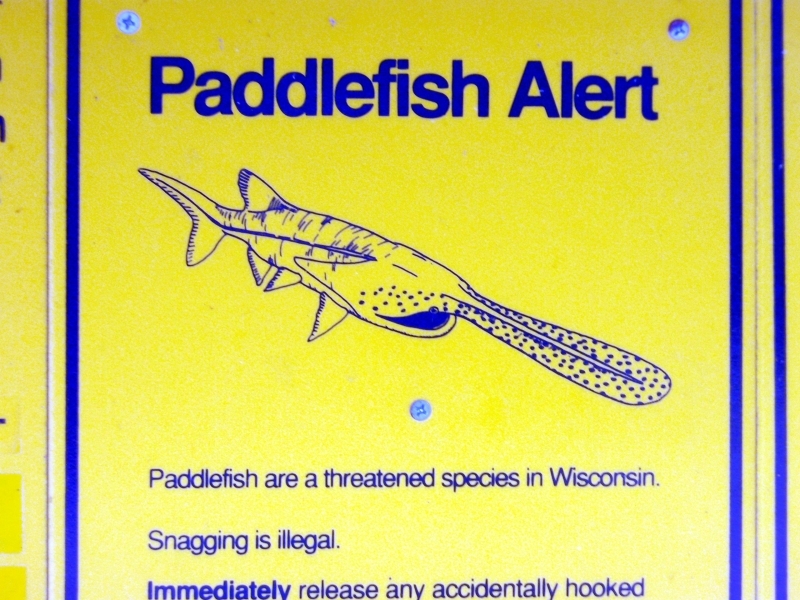 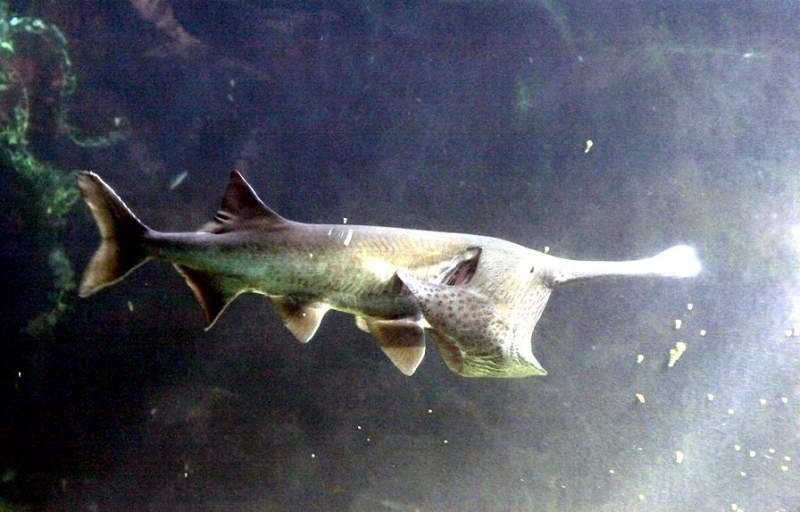 Paddlefish are well adapted to living in rivers. 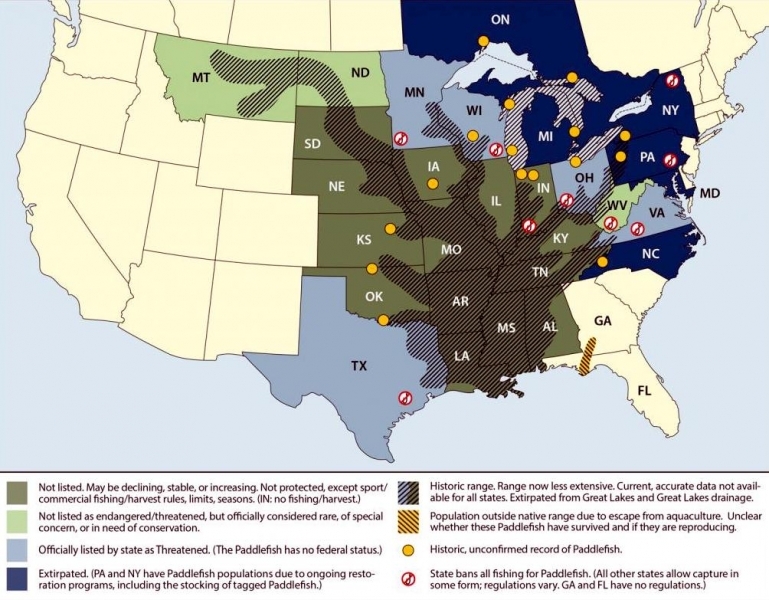 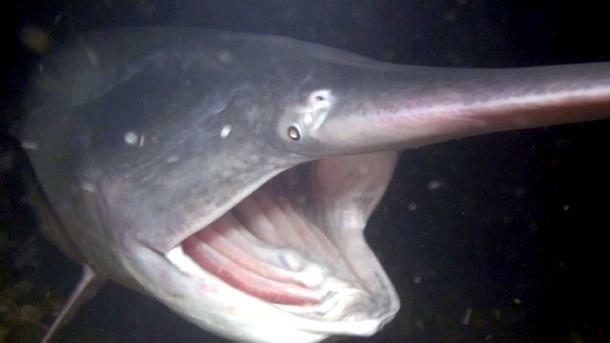 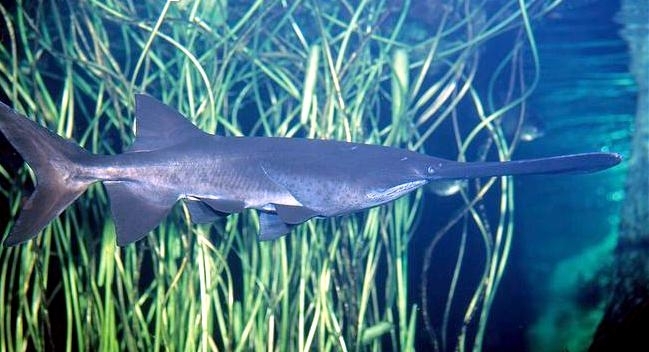 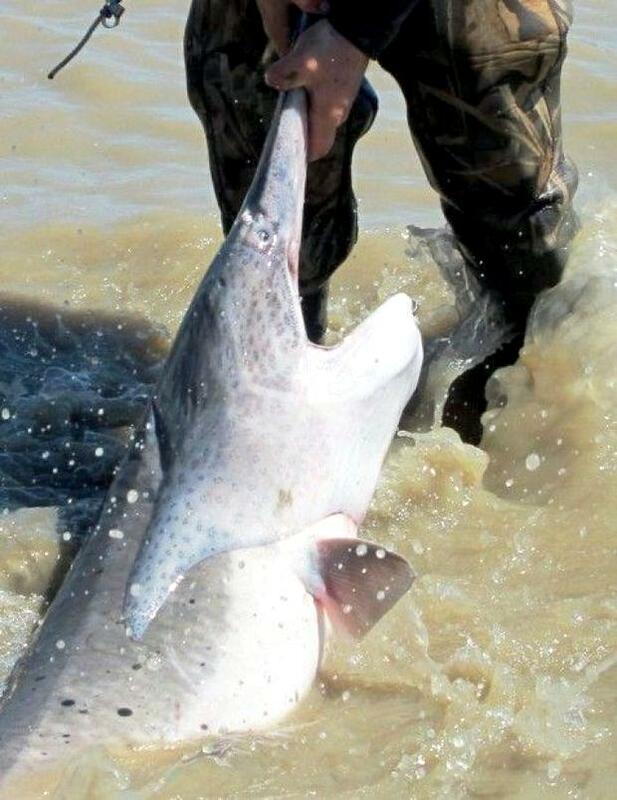 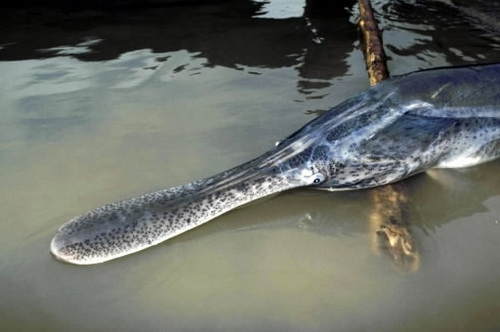 Paddlefish are known to occur from large rivers throughout much of the Mississippi Valley and adjacent Gulf slope drainages in North America. 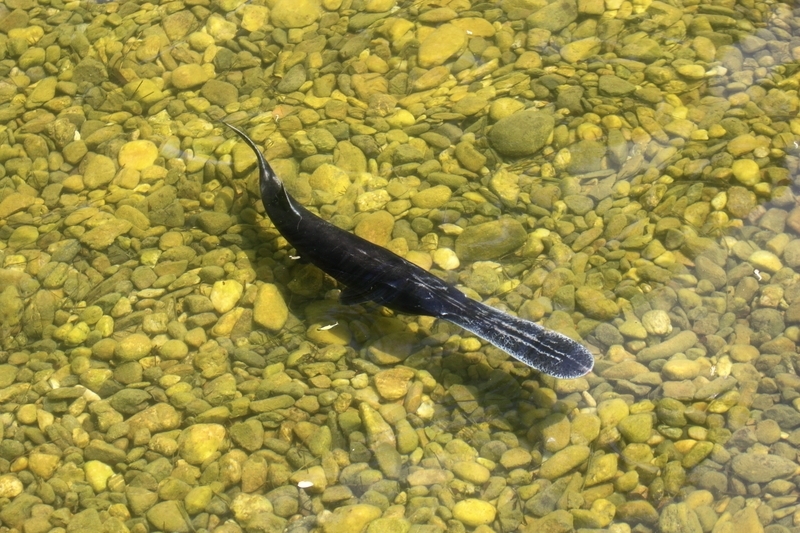 They frequent many types of river habitats but often seek out deeper, low current areas such as side channels, backwaters, oxbow, river-lakes and tail-waters below dams. 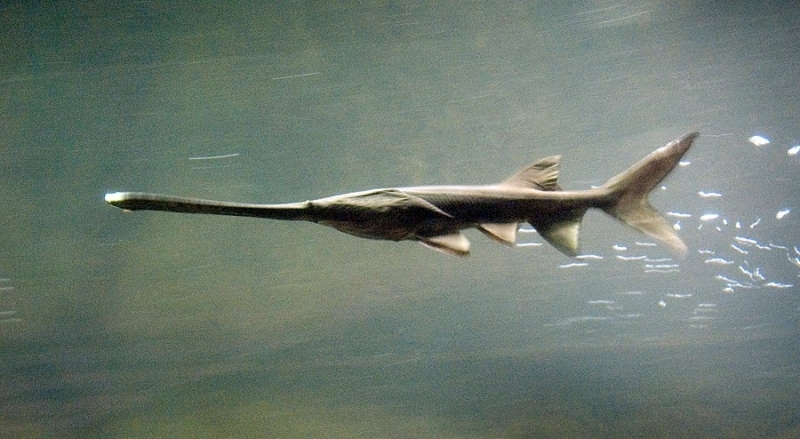 Paddlefish are highly mobile and have been observed to move more than 2,000 miles in a river system. 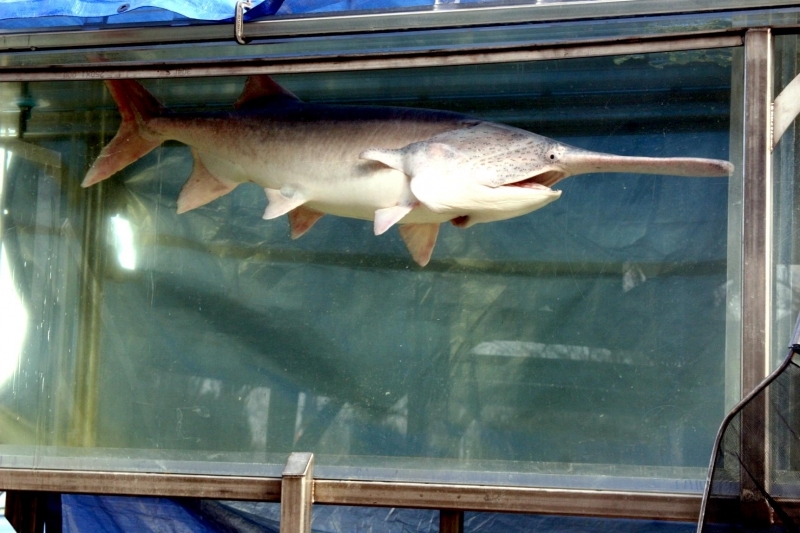 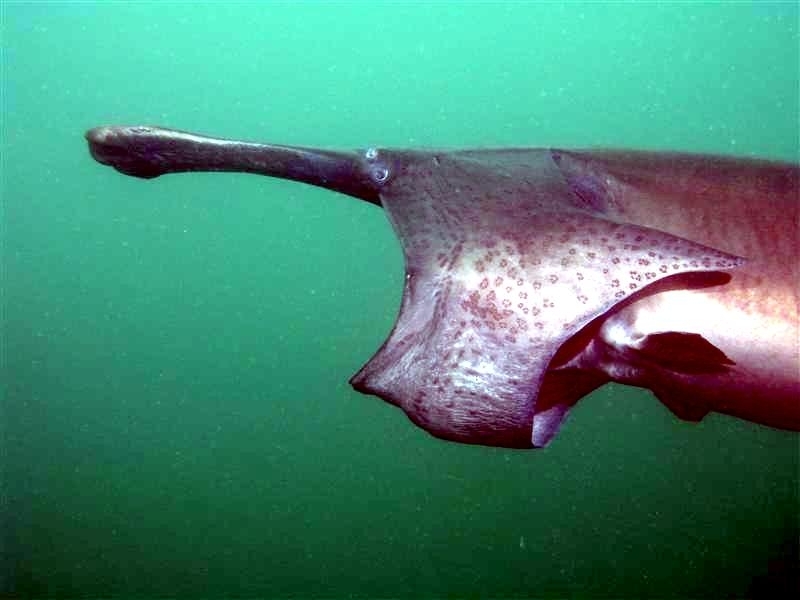 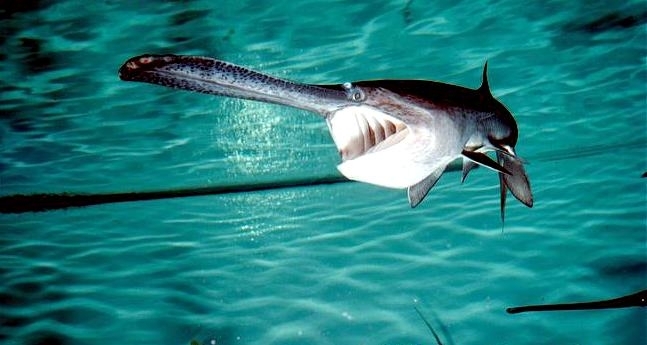 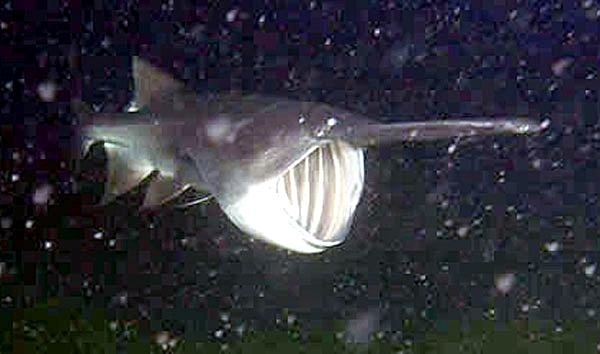 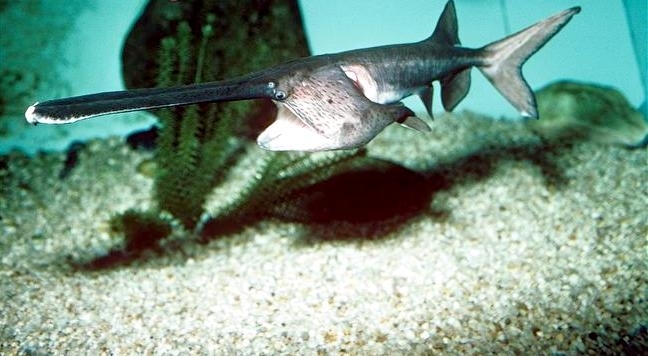 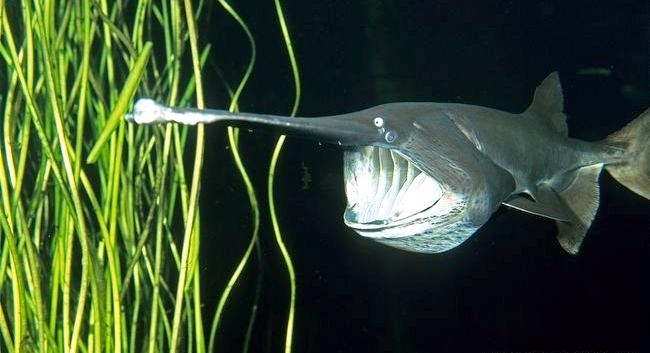 Paddlefish can be distinguished from other freshwater fish by the presence of a very large mouth and a long, paddle-shaped snout (called a rostrum) that is about one third the length of the body. 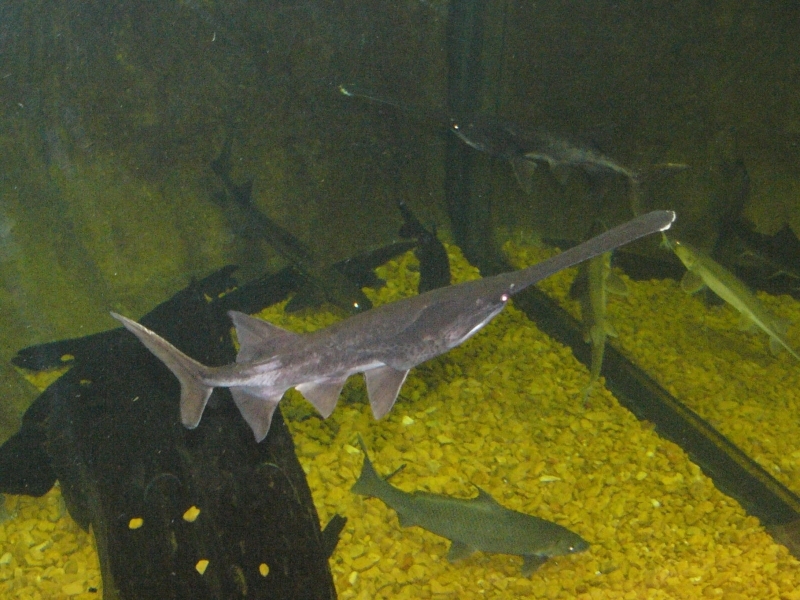 Early investigators thought that Paddlefish used the rostrum to dig food items from the bottom or to dislodge them from vegetation. 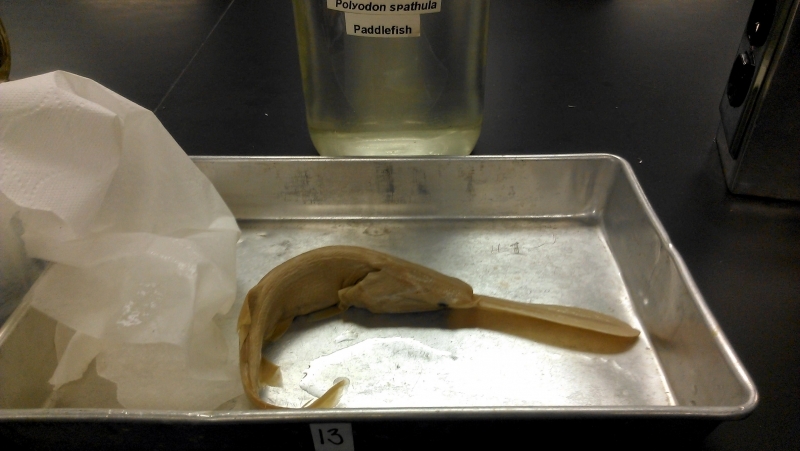 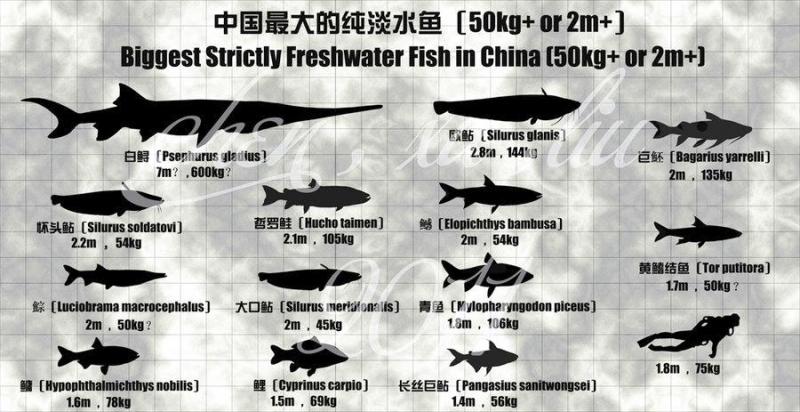 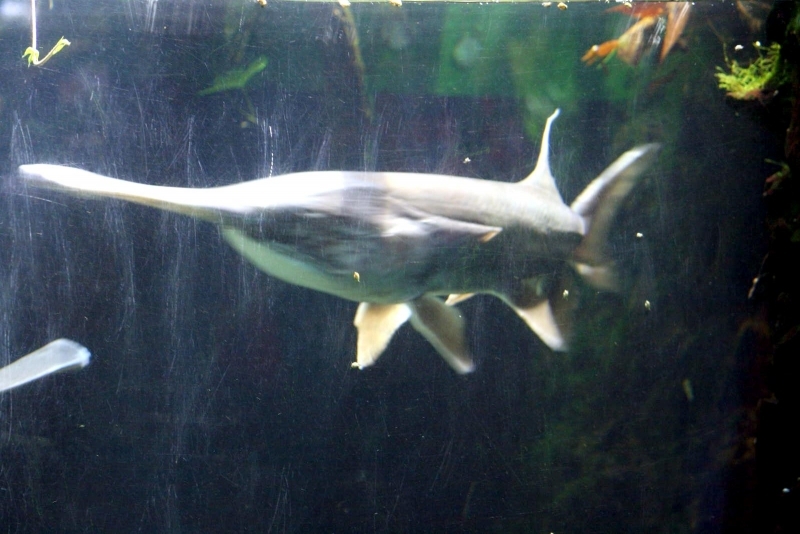 These ideas were refuted when Paddlefish were found to be filter feeders, straining zooplankton out of the water column. 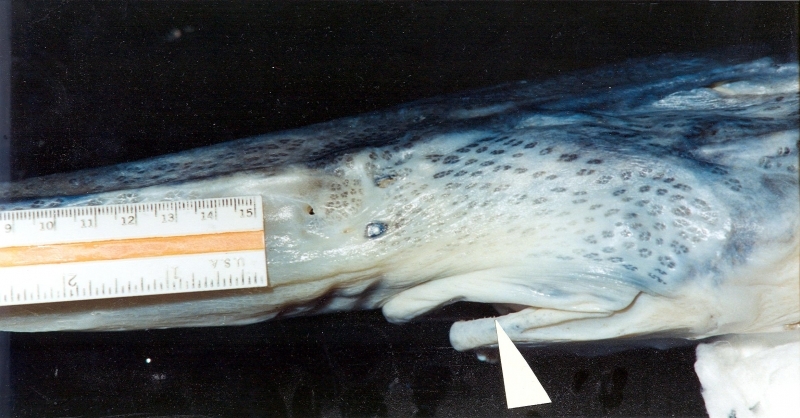 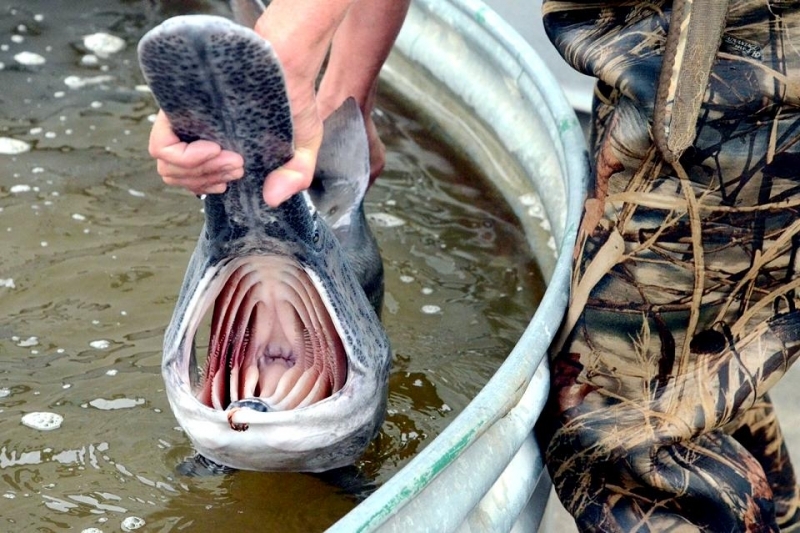 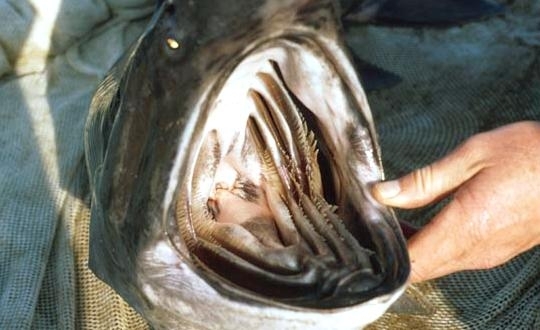 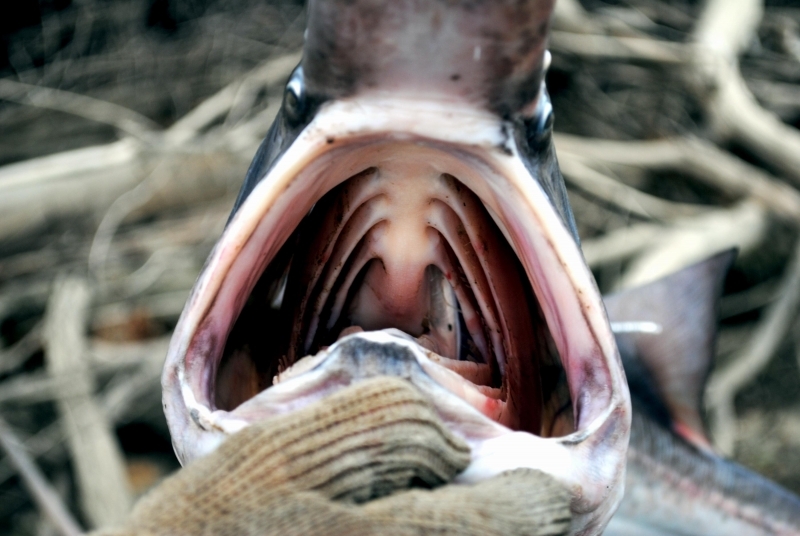 Gill arches are the predominant features seen inside the Paddlefish’s mouth. 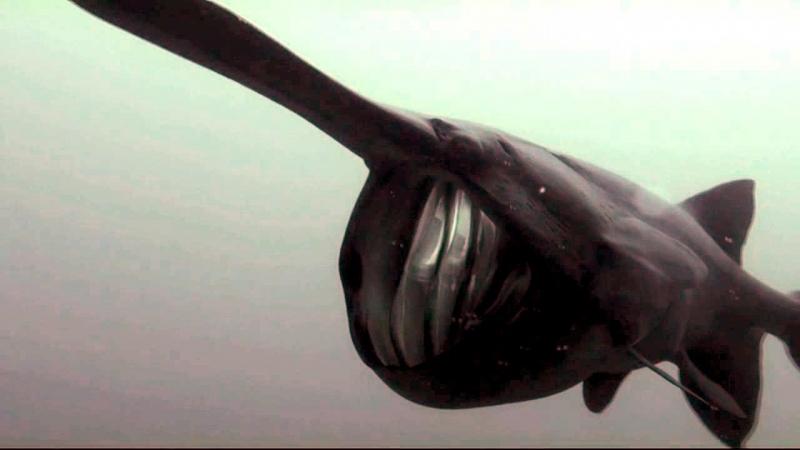 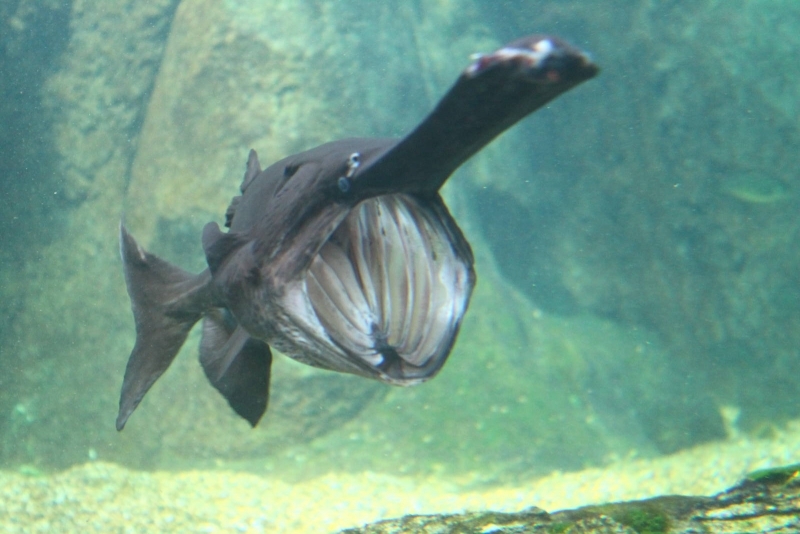 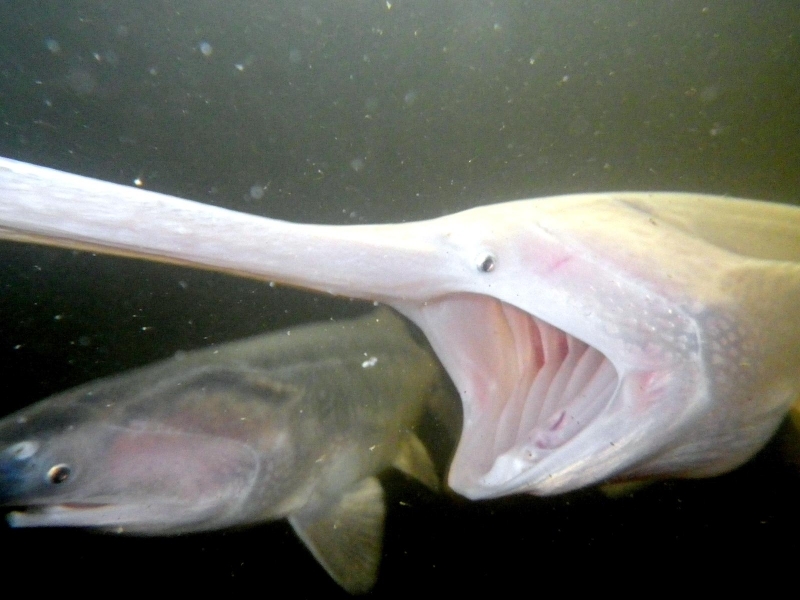 Paddlefish swim with their mouth open, indiscriminately filtering the water. 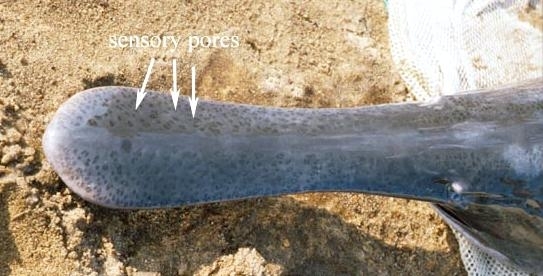 The gill arches have filaments on them called gill rakers that sieve the zooplankton organisms from the water. 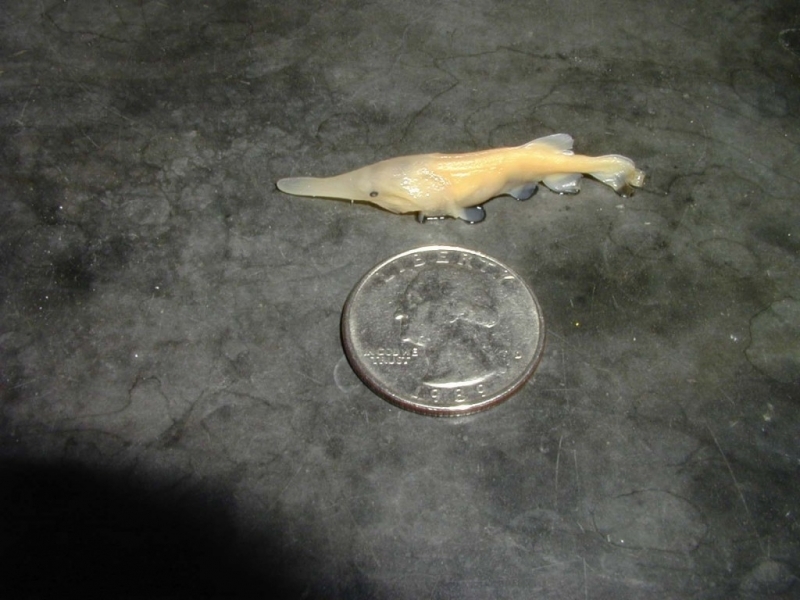 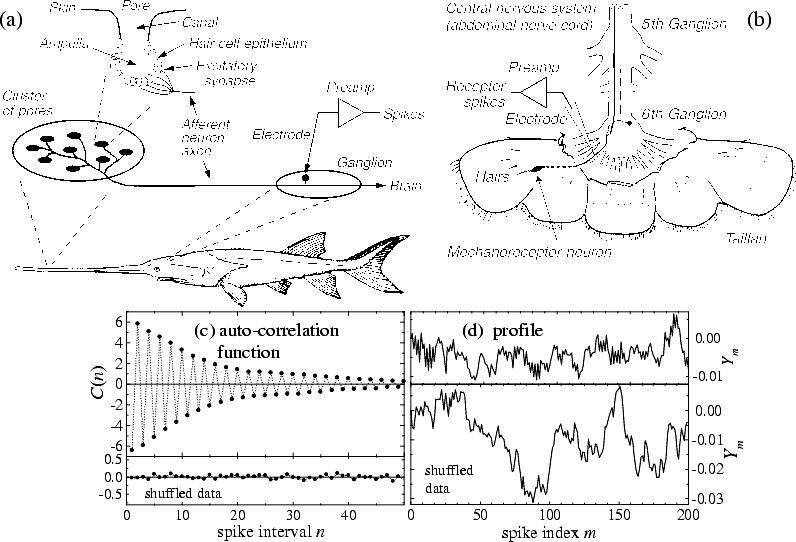 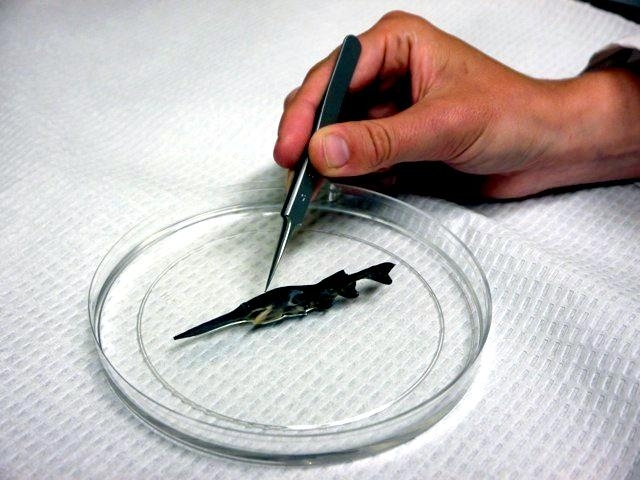 One recent study demonstrated that electrosensory receptors in Paddlefish rostrum can detect weak electrical fields and suggested that Paddlefish use their rostrum as an electrosensory “antenna” to detect zooplankton. 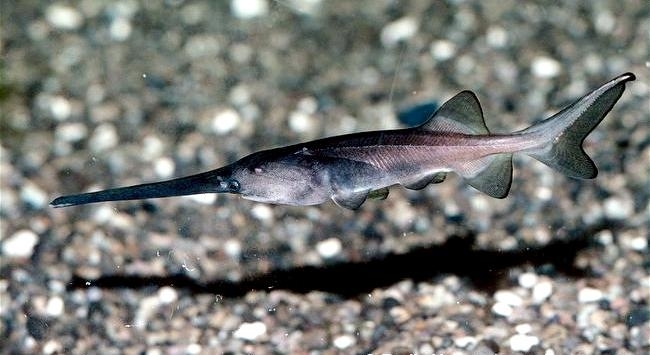 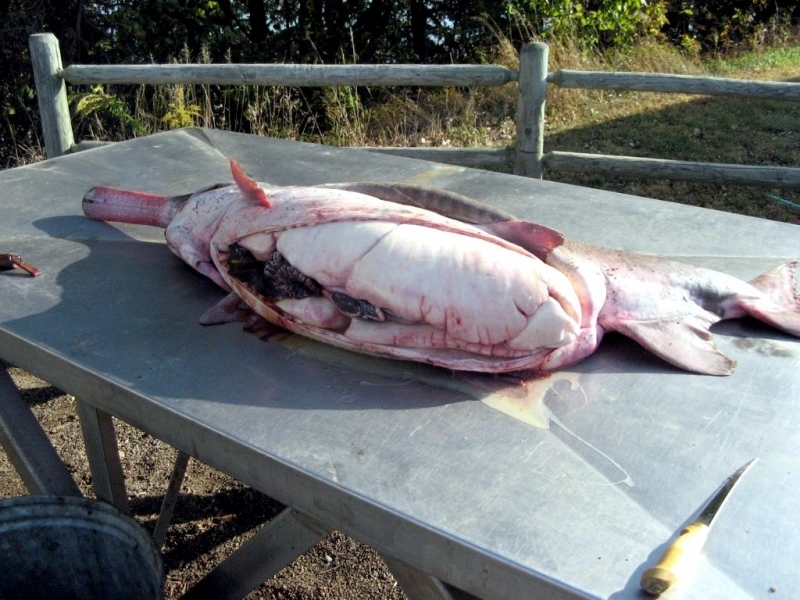 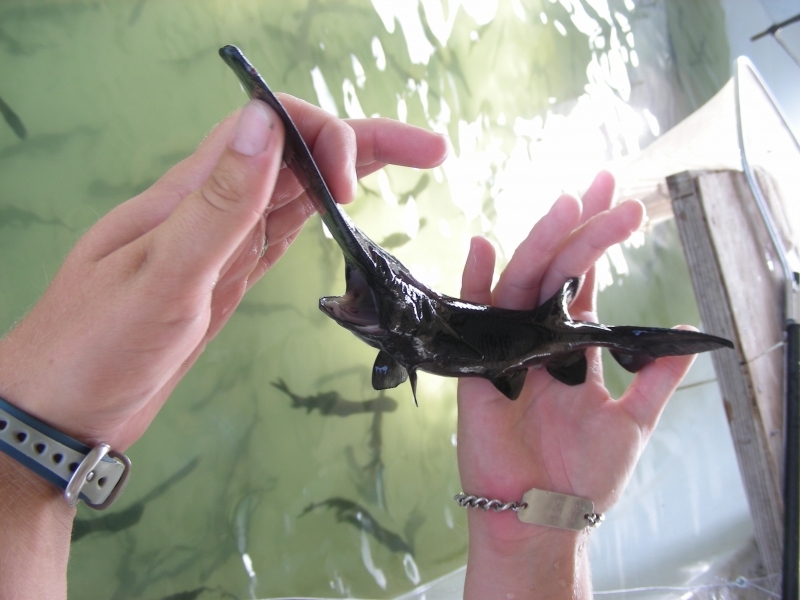 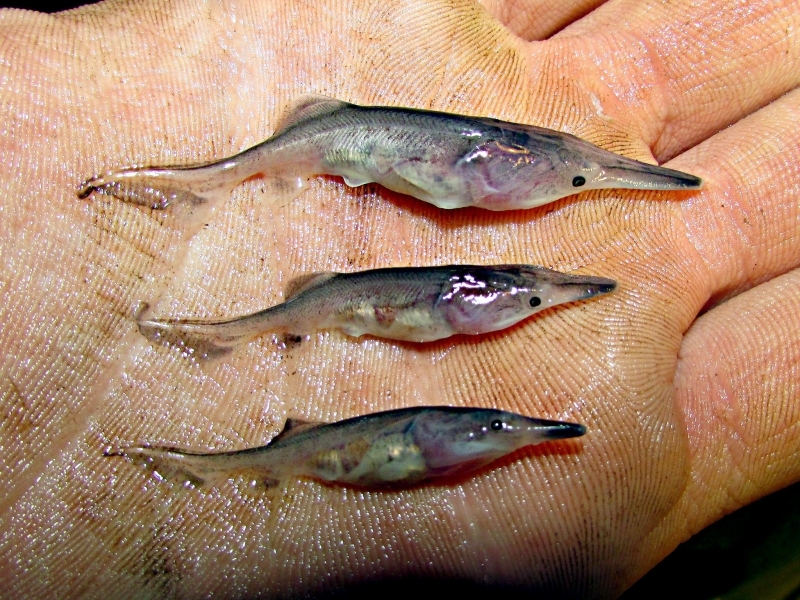 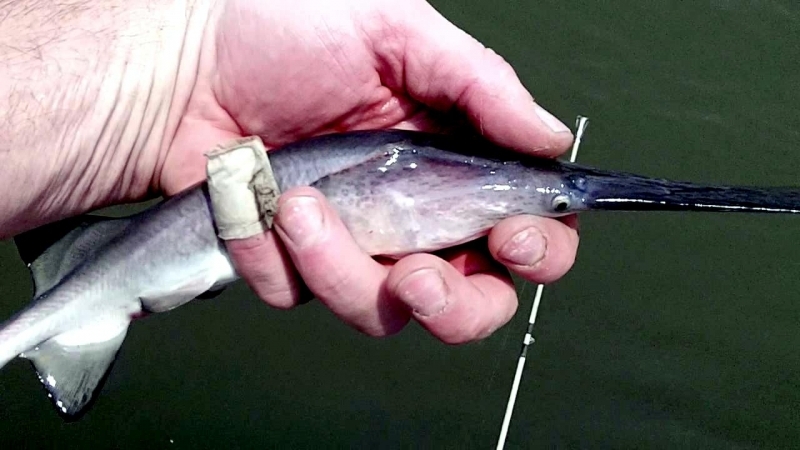 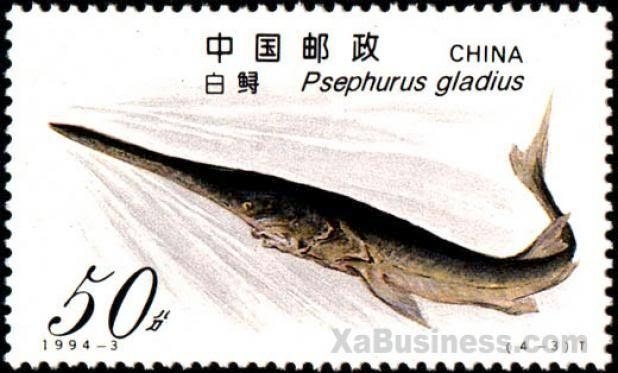 Although the rostrum may aid the Paddlefish in finding concentrations of zooplankton for feeding, some studies have shown that Paddlefish with missing or severely damaged rostrums appear to be in good condition and grow similarly to those Paddlefish with healthy, intact rostrums. 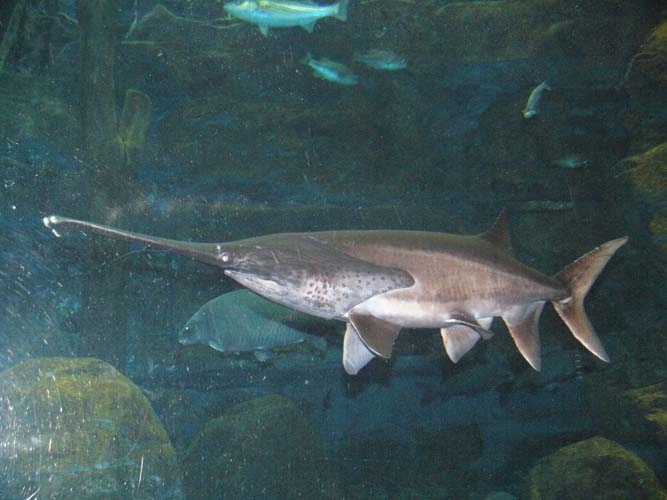 Paddlefish are one of the largest freshwater fishes in North America, commonly reaching 5 feet or more in length and 60 pounds in weight. 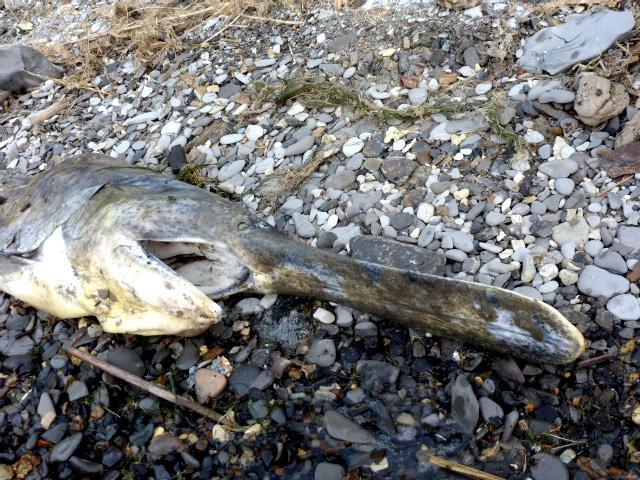 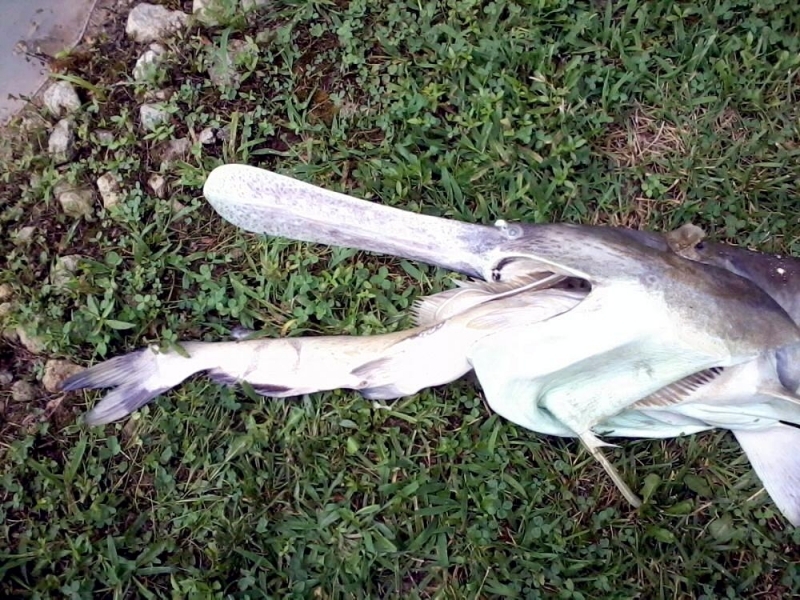 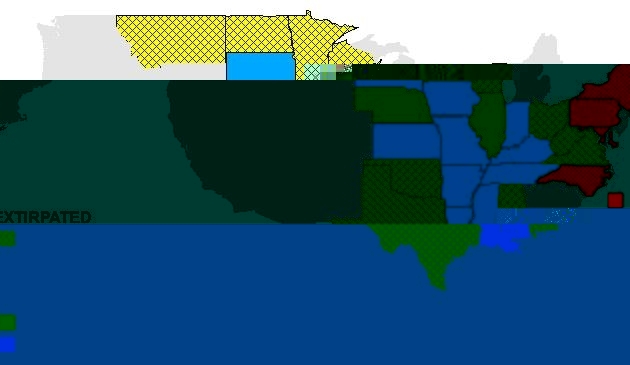 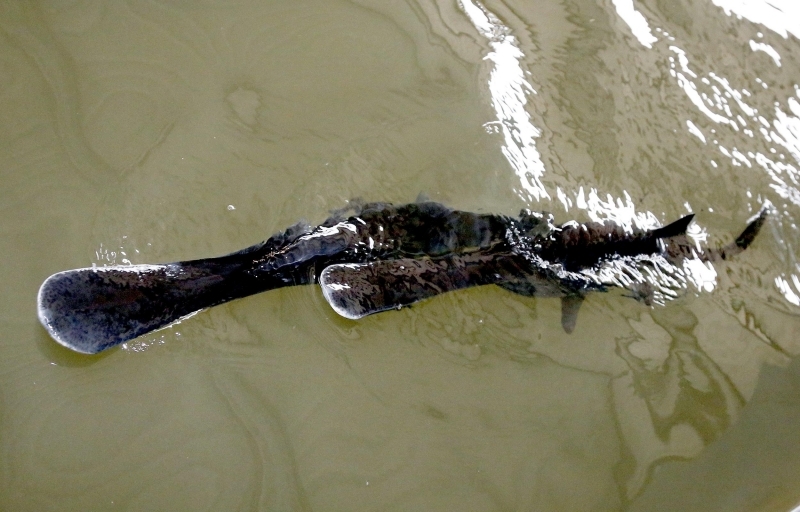 The largest Paddlefish on record was caught in Iowa and weighed 198 pounds. 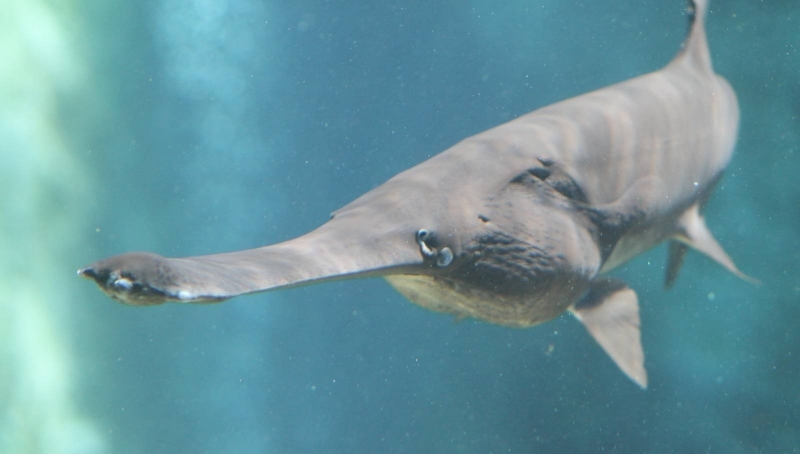 Although determining their age is difficult, some studies have recently estimated that Paddlefish may live in excess of 50 years. 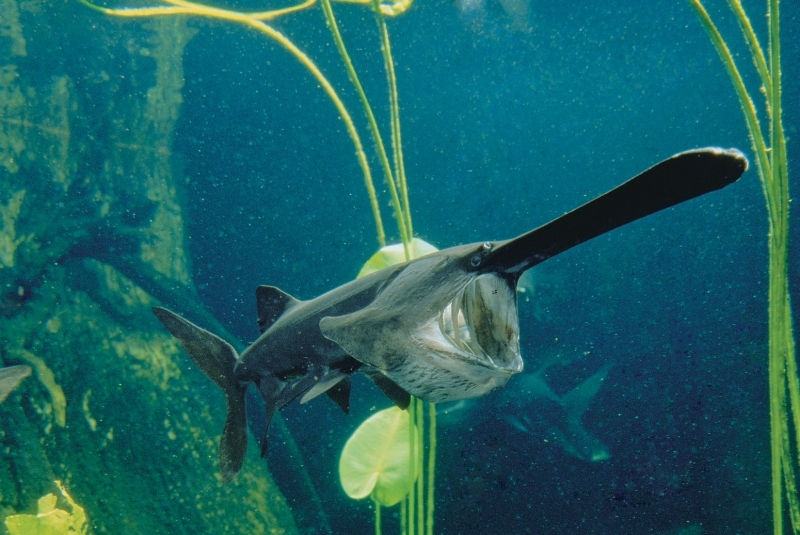 Paddlefish were once common in the fish assemblage in central U.S. rivers, but populations have declined in many systems. 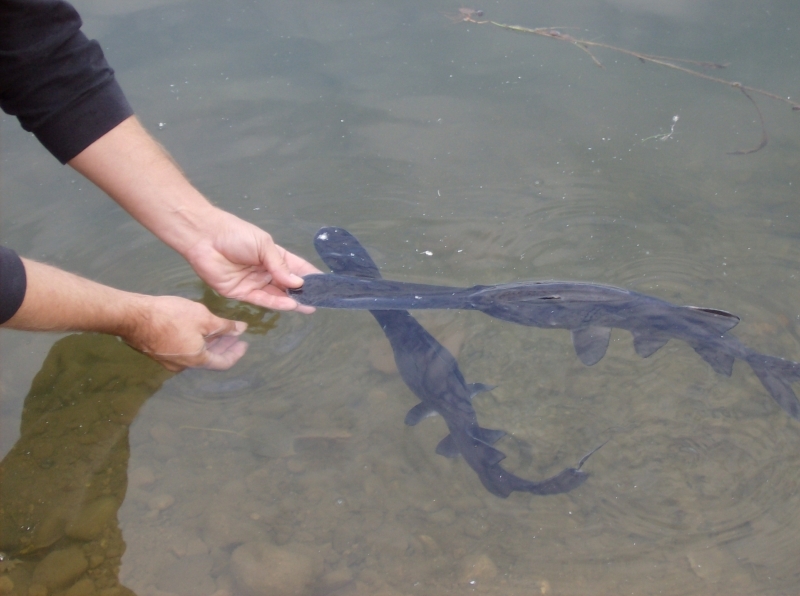 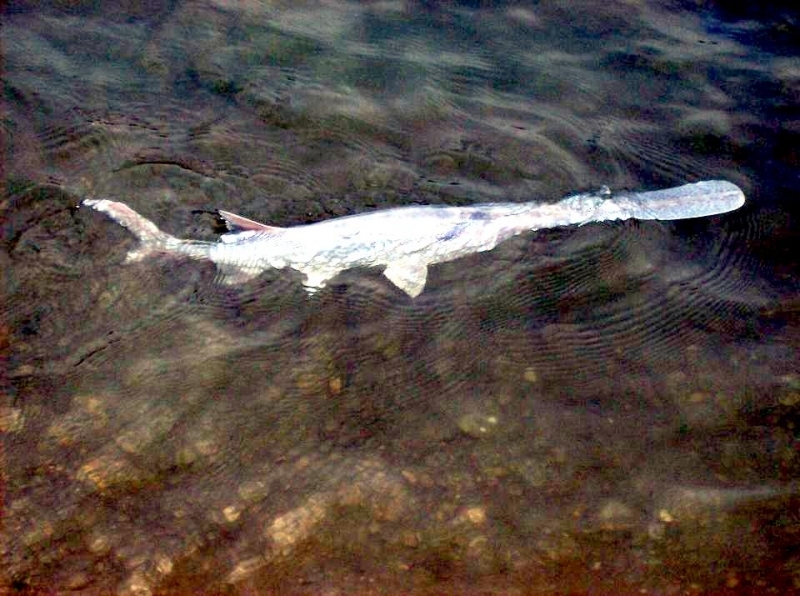 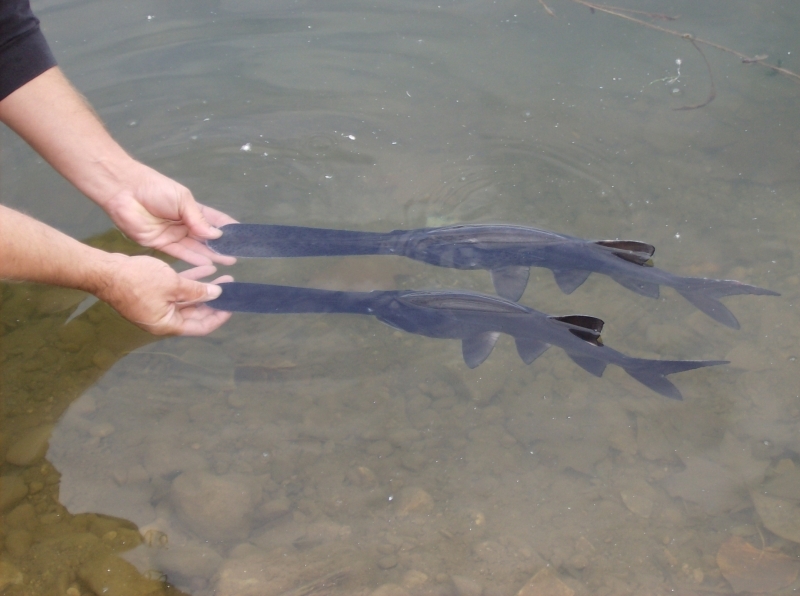 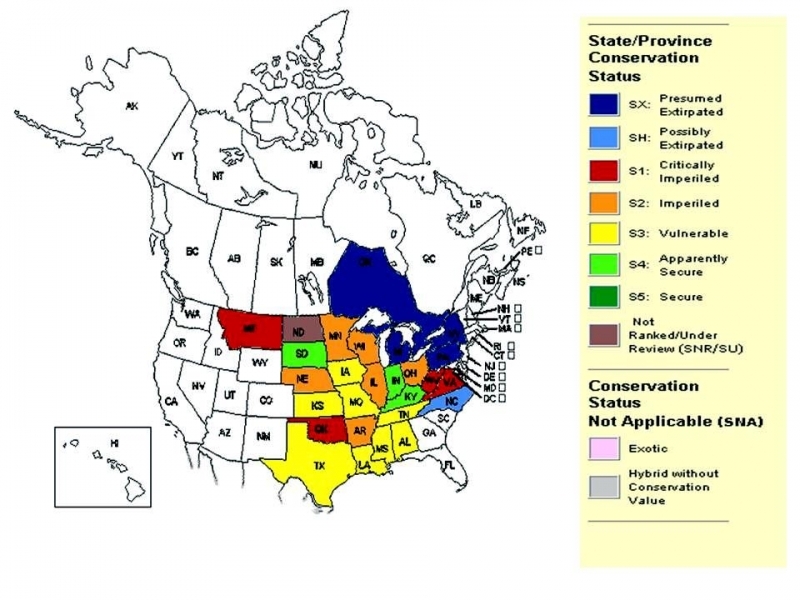 Paddlefish populations have been negatively affected by over-harvest, sedimentation & river modifications. 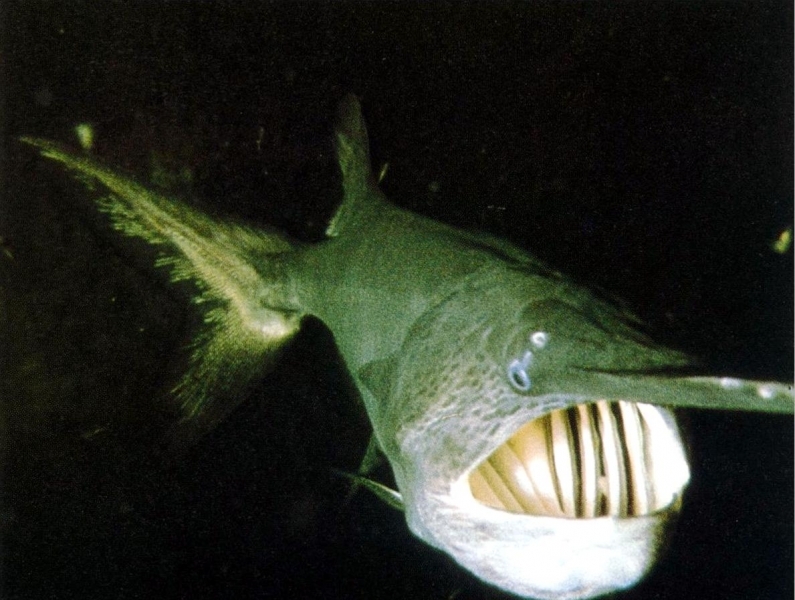 Dams in particular have had an adverse affect on Paddlefish because they alter traditional Paddlefish habitats and can block spawning migrations and other movements. 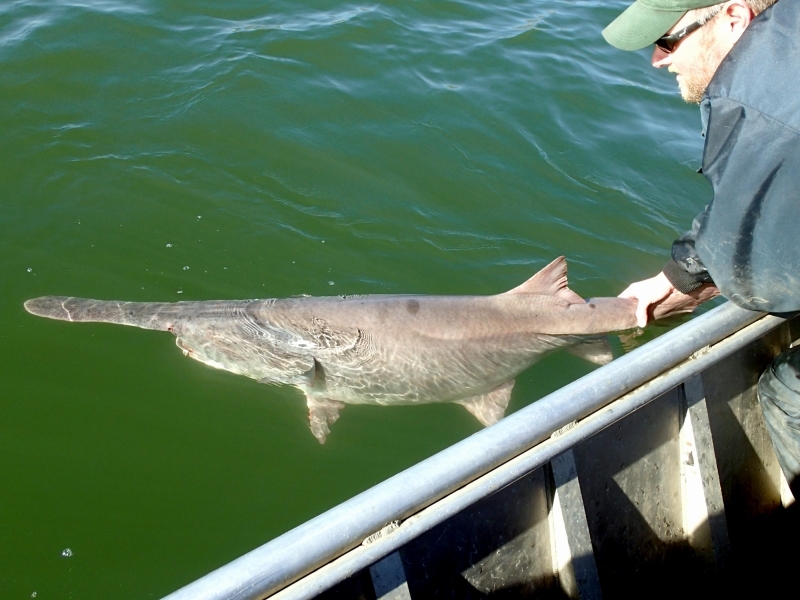 Paddlefish populations dramatically declined from over-fishing after the turn of the last century. 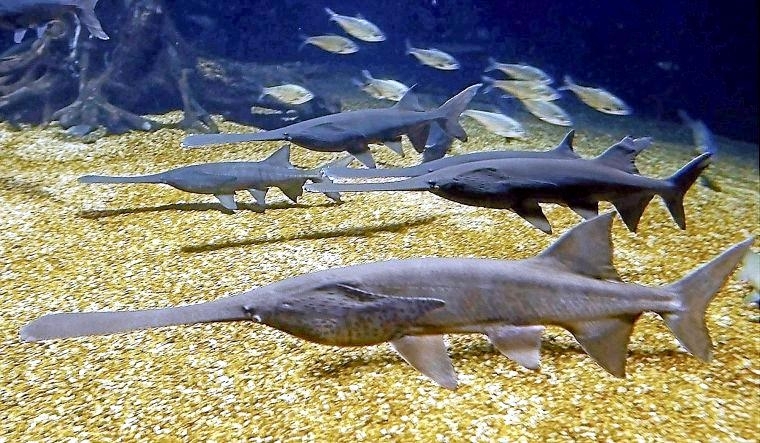 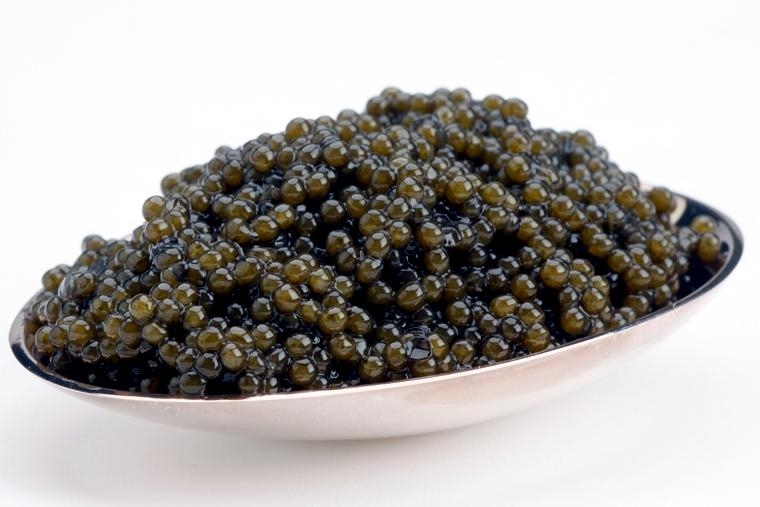 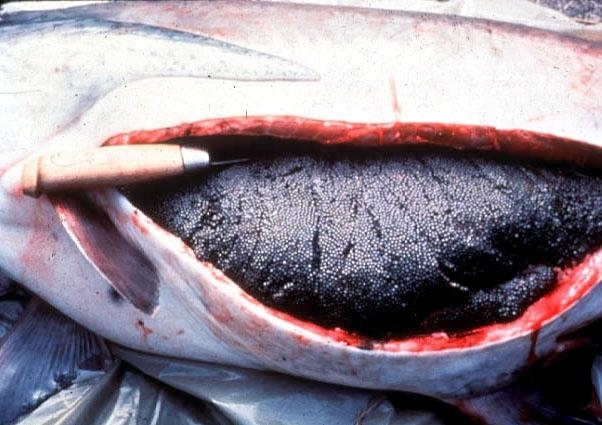 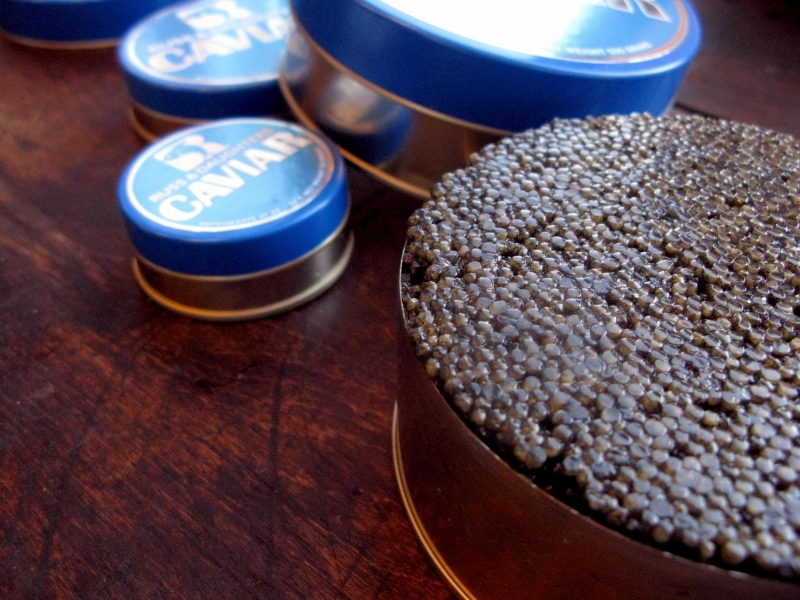 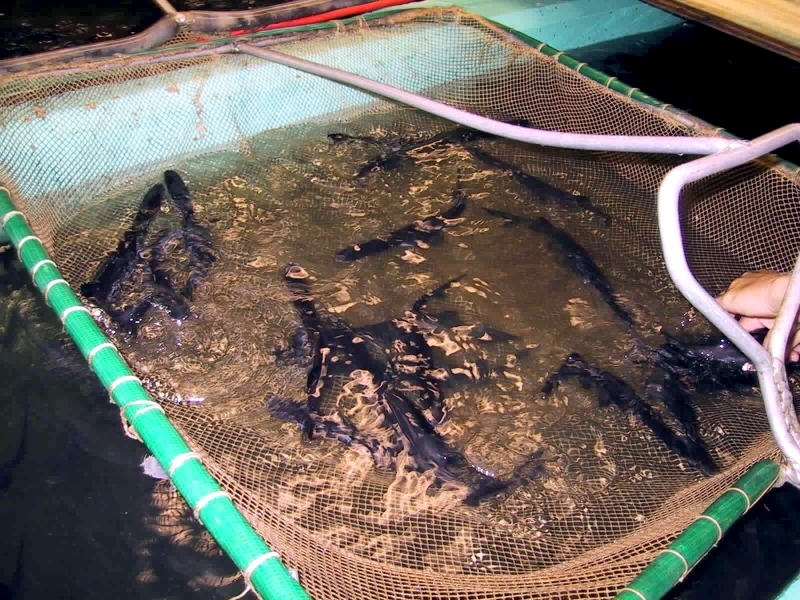 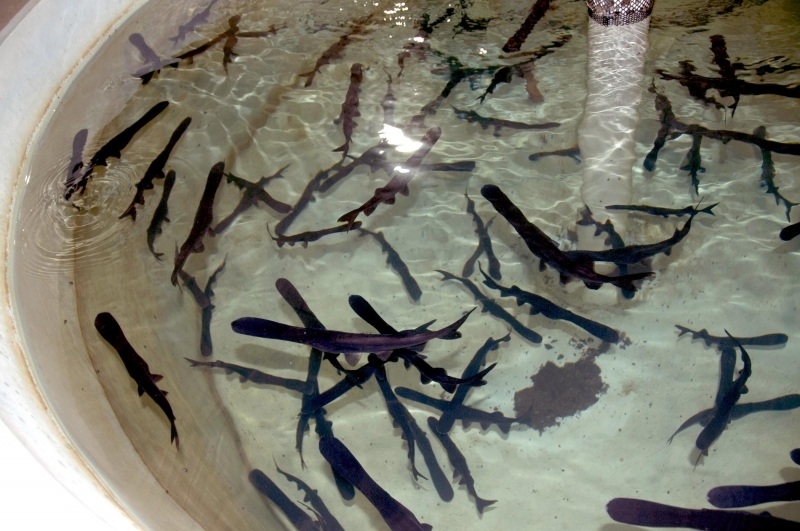 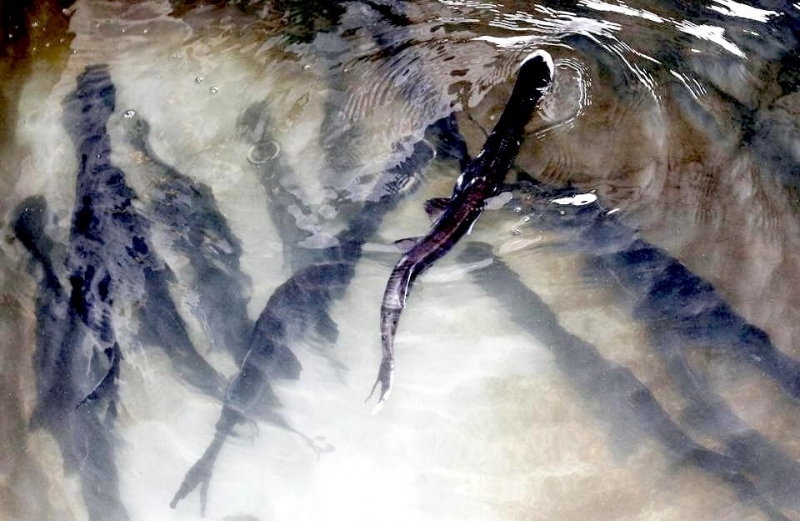 Concern for Paddlefish stocks has recently risen because the collapse of most sturgeon stocks in the world has fueled increased demand for Paddlefish eggs for the lucrative caviar trade. 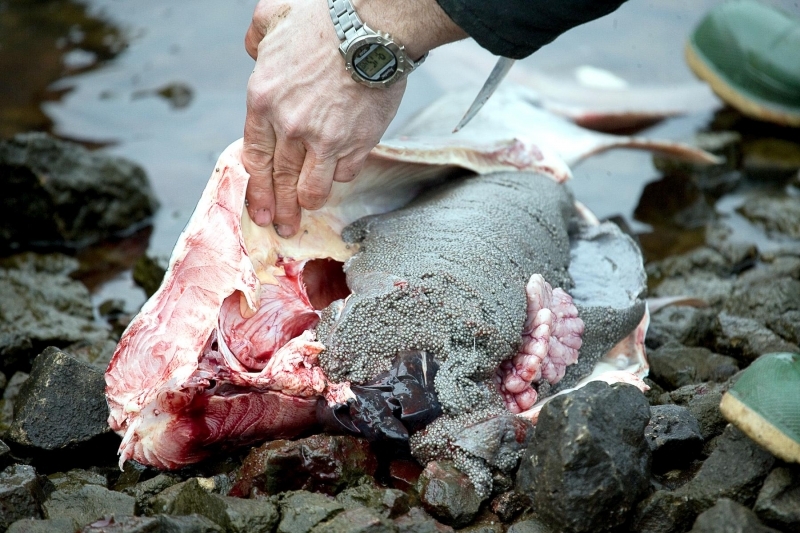 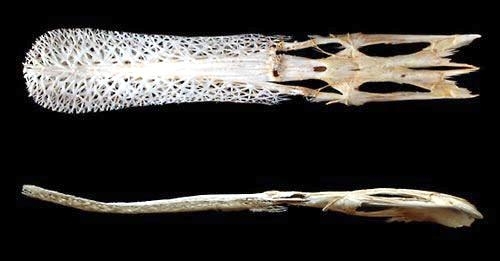 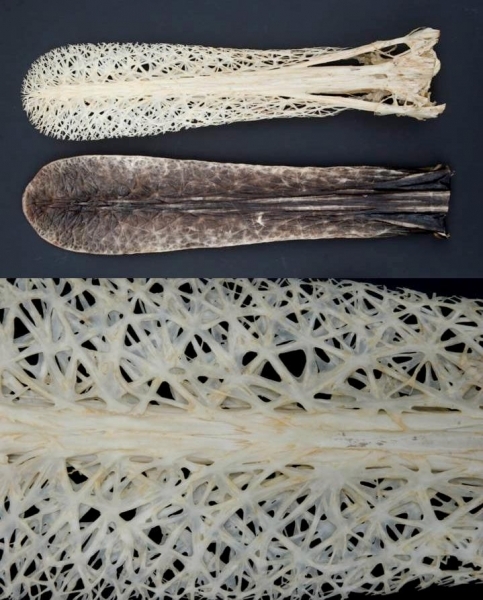 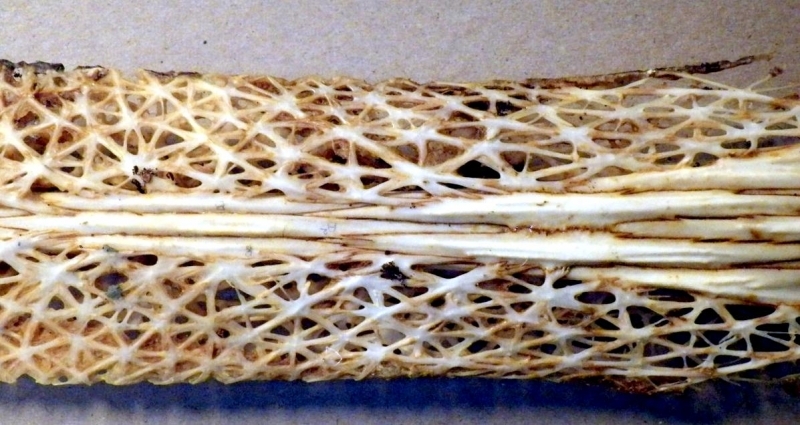 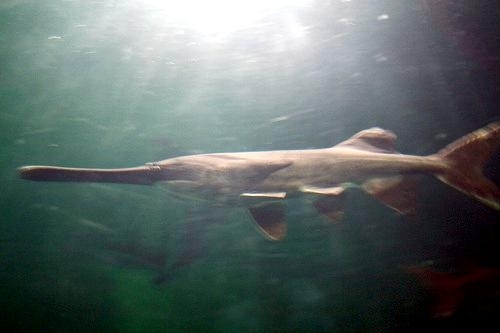 Paddlefish are not closely related to sharks, but they do share some common characteristics including a skeleton primarily composed of cartilage and a deeply forked, abbreviate heterocercal tail fin (the top fin lobe is slightly larger than the lower fin lobe). 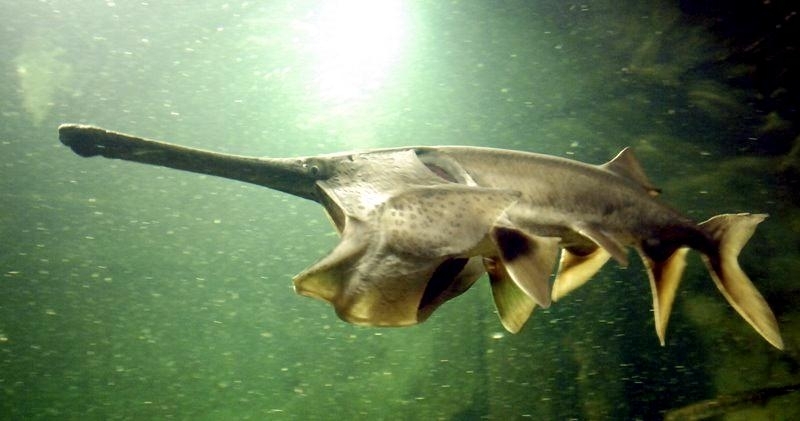 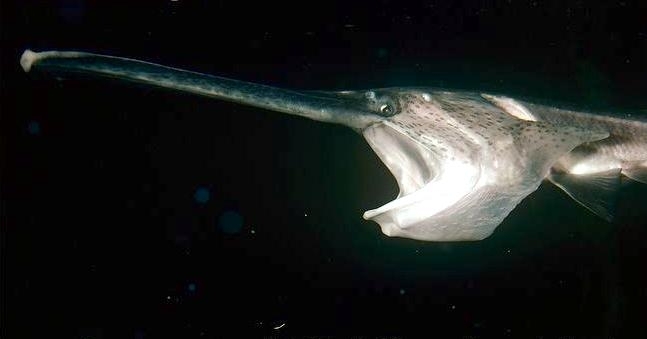 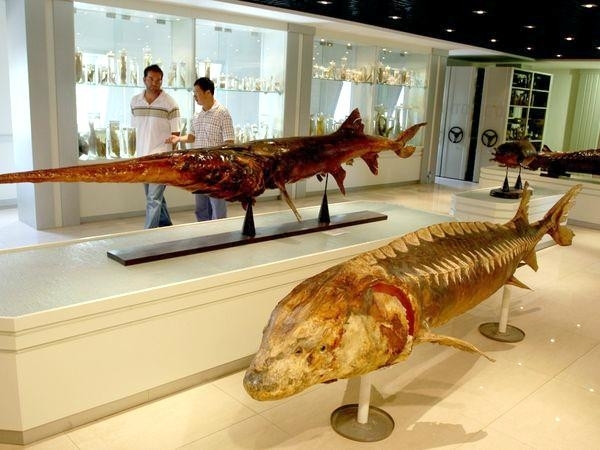 Paddlefish are one of the oldest fishes, with fossil records dating their first appearance at 300 to 400 million years ago (about 50 million years before the first dinosaurs appeared).